Where do I use my Footasylum voucher code? Select the Discount you wish to use at Footasylum from NetVoucherCodes. Copy the code provided and follow the link through to the main page. Select products you wish to buy, choose your size and add them to your online shopping basket. Once finished, proceed to your basket. At the checkout, click ‘Have a promo / Student Code’. Insert your discount into the box provided and select ‘Apply’. Click ‘Pay Securely’ to complete your order. "Free delivery on orders when you spend £50 or more at Footasylum." "Sign up to Unidays and receive a 10% off student discount code to use in any order." "Free delivery and returns to all of Footasylum’s 65+ stores across the UK." Footasylum has really established their place on the UK high street, with over 10 years experience under their belt and over 65 stores across the country helping them lead the sport/streetwear scene. Operating as both a sportswear and streetwear retailer means Footasylum will leave you truly spoilt for choice when it comes to brands, here you can find huge names such as Armani Jeans, Calvin Klein, Lacoste and much more. T-shirts, track tops and polos; to jeans, joggers and shorts - Footasylum has you covered from head to toe, and that’s before footwear is even mentioned - the latest in Nike trainers, Vans plimsolls or Adidas running shoes can be found here. Footasylum is the go-to destination for any gift or present, even if you’re really just after a treat for yourself. The ‘Just-landed’ section is filled with the newest releases from all the brands you know and love - this is the perfect place to find inspiration for your upcoming purchase if you’re stuck for ideas. Or even better, check out ‘The Lowdown’ a portion of the site devoted to the newest clothes, shoes and more - informing you about the product and when they’re available for purchase. 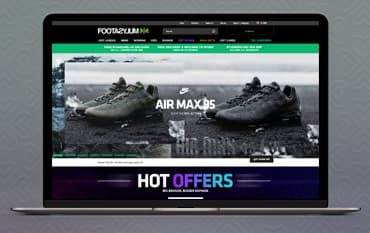 Browse the ‘hot offers’ section to find the latest Footasylum bargains and save yourself money, even bigger savings can be found when you shop with a Footasylum code from us. If you’re currently in education at either college or university, then your studies could be rewarded through a student discount on your next Footasylum order. Simply log into Unidays with a valid account and receive a 10% off discount code! If you’re looking for more ways to save then don’t forget to take a look at the Footasylum newsletter, upon registration you’ll be the first in line for exclusive offers and discounts, in addition to hearing about new product releases before anyone else. Don’t miss out on a range of huge discounts across all product categories within the ‘Hot Offers’ section. Here you’ll find trainers, tracksuits, t-shirts and more all at highly reduced prices - featuring brands like Jack Wolfskin, Mitchell & Ness and Nike. Items can be priced as low as 25% of their original RRP within the sale, still the biggest names on the high street, just at the lowest prices. Take advantage of the free delivery when you spend £50 or more on your order, or free delivery and returns to Footasylum’s 65+ stores across the UK. Footasylum UK customers have various delivery options available - a home delivery service which includes an express next day delivery, or free delivery to one of Footasylum’s high street stores or free delivery to a BFPO address. Standard £3.95 | Next Day £4.99 | Next Day Evening £6.99 | Sunday £6.99 - full details here. Footasylum guarantee to refund or exchange any item you’re not completely happy with, providing you return it to them in an unused and sellable condition within 14 days of the date of your receipt. Footasylum aims to process all returns within 7 days of us receiving the goods back in our warehouse. However, please make sure that you fill out your returns form in full before sending it back to us as this will help to avoid any delays in identifying and processing your return. Footasylum opening times are relative to the retail centre they operate in, for more information about your local branch please refer to the store locator tool featured on their website. Writing address - Footasylum Customer Services & Returns, Unit M3 Heywood Distribution Park, Pilsworth Road, Heywood, Lancashire OL10 2TR. Founded in 2005, Footasylum has leapt into becoming a top sportswear and streetwear retailer - paving the way within the industry with over 65 stores now open in the UK. Stocking huge brand giants like Nike and Adidas, in addition to fresh names in fashion such as Jameson Carter or Gym King. Footasylum guarantees their customers amazing choice when either instore or online, meaning you can expect the very latest in footwear, clothing and accessories from big brands like EA7, The North Face and Antony Morato. Saving you money whilst shopping is a virtue Footasylum likes to show off, hence why they’re home to a generous ‘hot offers’ section hosting many great deals, in addition to running a 10% student discount for all those studying higher education. Add to this a Footasylum promo code and you can save even more at the checkout. We are constantly on the hunt for first order Promo Codes for Footasylum to help you with your money saving. Our experts check dozens of sites for secret codes including NHS discounts, student sites & social media channels saving you time & money!